The best known vining veggies are built to grow upward, either by spiralling around their support, as beans do, or holding on with curling tendrils, as you see in peas and cucumbers. When given a trellis that works with their anatomy, these upward-growing crops can be great producers that are easy to pick because much of the crop ripens at eye level. If you are a new gardener, keep in mind that trellising any vegetable is not a one-time thing. Once vining vegetables get going, expect to supplement your trellis with more stakes and strings as needed to add height or structure. 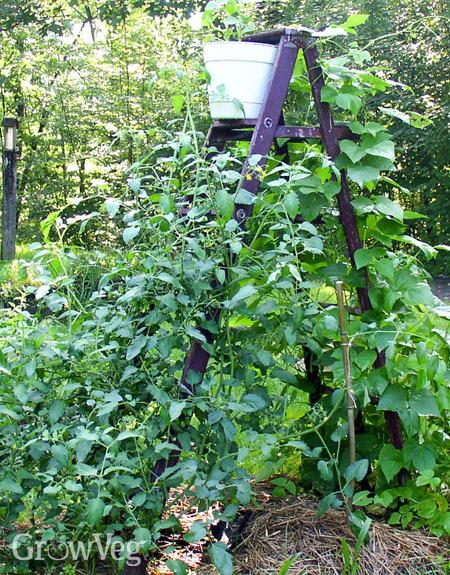 In small gardens, it can be great fun to turn your vining vegetables into a focal point, as I did (above) with a ladder garden planted with beans, tomatoes and cucumbers. One of the great things about a ladder garden is that you can paint the ladder a key colour, the same as you might do with a more refined trellis. In addition to serving as a charming garden element, a tower or teepee of colourful beans can be used to block out views you would rather not see. When vining plants are used to create a green wall, or screen, they are called privacy vines. Tall varieties of peas, long-vined climbing French beans and runner beans all love growing on a chain-link fence, or you can locate their trellis where no fence exists to grow a single-season privacy screen. This is a great way to see if you might want a permanent fence or a perennial vine in a certain spot, and your options are not limited to peas and beans. Fragrant Armenian ‘Tigger’ melons can be trained to a secure trellis, and in warm climates there is no finer pillar plant than red-stemmed Malabar spinach. Small-fruited ‘Minnesota Midget’ muskmelon or ‘Small Wonder’ spaghetti squash are fence-worthy edibles, too.